Stuffed with a savoury cheese and mushroom filling, these folded crêpes are given a quick sit in the oven to allow the cheese to melt. Melt 3 Tbsp. butter. Add to whole eggs and milk in large bowl; whisk until blended. Stir in flour and sugar. Let stand 30 min. Heat oven to 350ºF. Spray heavy 8-inch skillet with cooking spray; heat on medium heat. Pour 1/4 cup batter into skillet; tilt skillet to evenly cover bottom of skillet with batter. Cook 1 to 2 min. or until bottom of crêpe is lightly browned. Run spatula around edge of crêpe to loosen from skillet; turn crêpe. Cook 1 min. or until bottom of crêpe is lightly browned. Remove from skillet; set aside. Repeat with remaining batter to make 7 additional crêpes. Top crêpes with cheese, mushrooms, scrambled eggs and onions; fold in half. Place in 13x9-inch baking dish sprayed with cooking spray. 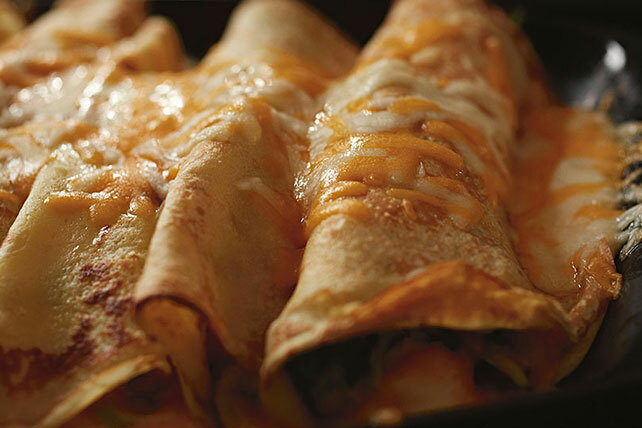 These delicious crêpes can be assembled ahead of time. Refrigerate until ready to heat in baking dish as directed, increasing baking time as needed until crêpes are heated through and cheese is melted.